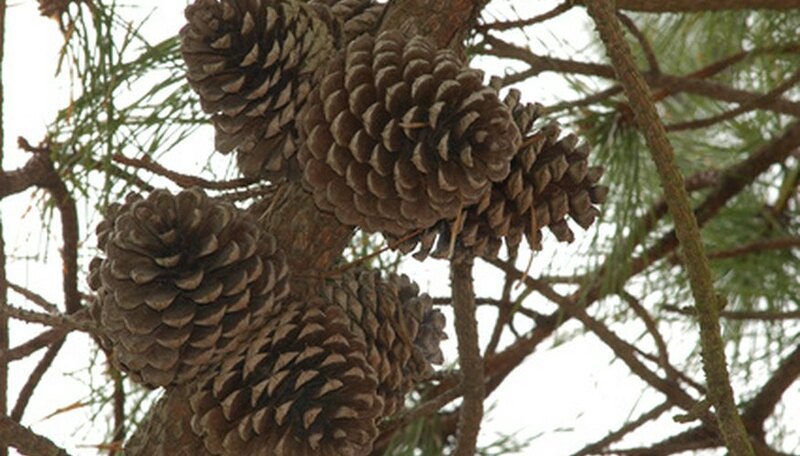 Pinecones are the conical or rounded woody fruit of the pine tree. They are characterized by woody scales that open to release the seeds. They are readily available in the fall on the ground all around pine trees and can also be purchased from craft stores. Pinecones come in many sizes and are widely used in a variety of craft projects, such as wreaths and ornaments. Door and wall wreaths can be made from pinecones using just a few simple items, such as Styrofoam rings, glue, spray paint, and decorations, such as beads, bows, ribbons, colored buttons, acorns, and berries. Craft glue can be used to attach the pinecones to the Styrofoam, as well as hot glue or decorative pins. Different sizes of pinecones can be used to create a pattern on the wreath. Pin cushions can also be made from pinecones. Take each pinecone and pull out a few of the stalks. Cut circles of material and sew a running stitch around the outside edge. As the edges are drawn up, stuff wadding in to make a soft ball. Use a glue gun and apply glue to the areas where the stalks have been pulled out of the pinecone and stuff the soft ball in. Christmas ornaments can also be made from pinecones, such as angel ornaments and wax and glitter ornaments. The angel ornaments can be made from the long, thin pinecones. Turn the cones upside down and glue a small wooden ball to the flat end for a head. Glue silk rose leaves to the back for wings and spray paint the cone silver or gold for the body. Tie a cord around the top of a pinecone and dip it into wax. Place in an egg carton to dry and, while still moist, decorate with glitter. Use the cord to hang the ornament on the Christmas tree.